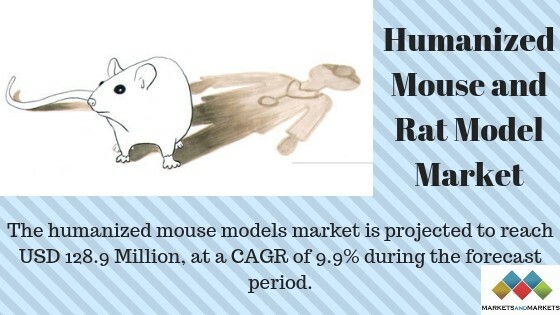 The Humanized Mouse and Rat Model Market is projected to reach USD 128.9 Million, at a CAGR of 9.9% during the forecast period. The Research Study on Humanized Mouse and Rat Model Market, By Considering useful aspects like; Application, End Users, Type- Global Future Forecast till 2022, published by MarketsandMarkets™, the report studies the global Humanized Mouse and Rat Model market over the forecast period to 2022. The cell-based humanized mouse models segment is further categorized into CD34, PBMC, and BLT humanized mouse models. In 2017, the CD34 models segment commanded the largest share of the cell-based humanized mouse models market and is expected to grow at the highest CAGR during the forecast period. CD34 mouse models are used as in vivo platforms for analyzing the safety and effectiveness of potential new drugs that can modulate the immune system. They are used for long-term studies in the fields of immuno-oncology, infectious disease, and graft versus host disease. Thus, the growing application areas of CD34 models are expected to trigger the demand for these models in the coming years. Our 850 fulltime analyst and SMEs at MarketsandMarkets™ are tracking global high growth markets following the “Growth Engagement Model — GEM”. The GEM aims at proactive collaboration with the clients to identify new opportunities, identify most important customers, write “Attack, avoid and defend” strategies, identify sources of incremental revenues for both the company and its competitors. MarketsandMarkets™ now coming up with 1,500 MicroQuadrants (Positioning top players across leaders, emerging companies, innovators, strategic players) annually in high growth emerging segments. MarketsandMarkets™ is determined to benefit more than 10,000 companies this year for their revenue planning and help them take their innovations/disruptions early to the market by providing them research ahead of the curve.